In 1925, Beatrice Blackwood of the University of Oxford's Pitt Rivers Museum took thirty-three photographs of Kainai people on the Blood Indian Reserve in Alberta as part of an anthropological project. In 2001, staff from the museum took copies of these photographs back to the Kainai and worked with community members to try to gain a better understanding of Kainai perspectives on the images. 'Pictures Bring Us Messages' is about that process, about why museum professionals and archivists must work with such communities, and about some of the considerations that need to be addressed when doing so. Exploring the meanings that historic photographs have for source communities, Alison K. Brown, Laura Peers, and members of the Kainai Nation develop and demonstrate culturally appropriate ways of researching, curating, archiving, accessing, and otherwise using museum and archival collections. They describe the process of relationship building that has been crucial to the research and the current and future benefits of this new relationship. 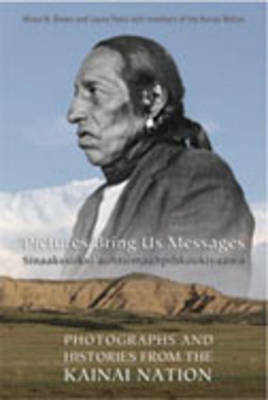 While based in Canada, the dynamics of the 'Pictures Bring Us Messages' project is relevant to indigenous peoples and heritage institutions around the world.